Clipper is our #1 recommendation for the control of Watermeal (Wolffia Columbiana) in ponds. 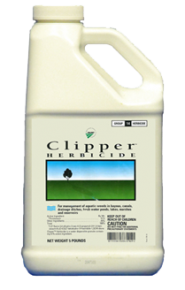 Clipper can also control duckweed and a host of submerged weeds and it controls them Fast! Fast! Fast!. Historically, floating Watermeal has been resistant to nearly all control choices and slow when it did work. 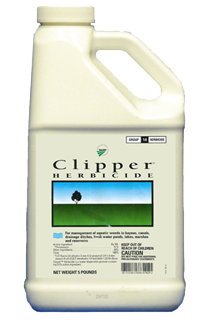 The game has changed with the introduction of Clipper herbicide. Clipper dissipates quickly in the water providing visible results in just 7-14 days! It does not accumulate in pond sediment. Easily mixes with water for easy application. Free Clipper measuring cup included. This is a value product that delivers results and a great bulk price-point for those bigger ponds. Rate examples below are average label doses. One Pound = 16 Ounces. Sample 75' x 75' Pond (.13) Acre 3 ft avg depth. Sample 105' x 105' Pond (.25) Acre 3 ft avg depth. Sample 148' x 148' Pond (.50) Acre 3 ft avg depth. *Consult Label for exact Doses, Water Use Restrictions & Important Application Directions. The Clipper Product Label is available for download in pdf.